It’s that time of year where we are bound to start gathering indoors more around the table for fun meals with family and friends. And when the time comes, I like to have a fun, but understated tablescape ready to set up. 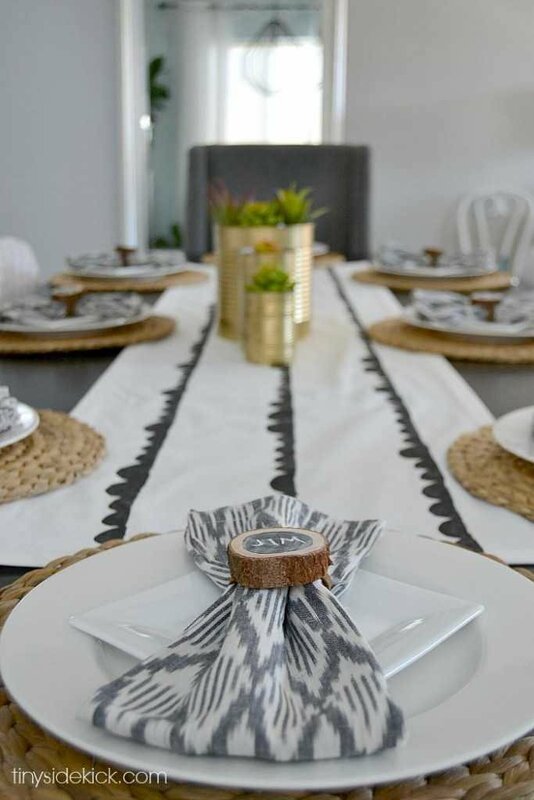 Setting and decorating a table for a special occasion can get really expensive, but it doesn’t have to. Believe me if I have extra cash in the budget to decorate, it is most likely going into something that I have out year round, not something I pull out a few times a year. 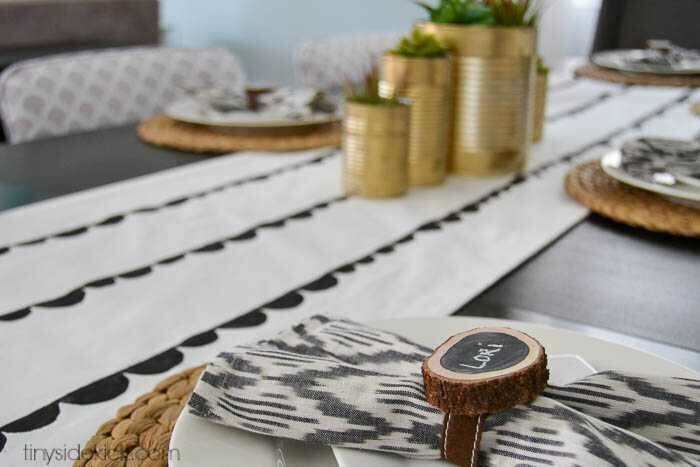 This year I’m keeping it super simple with a bit of natural textures, my everyday white plates, a shot of gold (cause everyone loves a hint of glam,) and a super neutral DIY stamped scallop pattern table runner. And you are going to love what I used to stamp the pattern on here! One of the best things about spending as little as possible on textiles for the table is the fact that they are going to get stained. I mean I don’t know about you, but the dining table isn’t just for show people. We eat there. Some might even stuff their face. And spills happen. When they do, and they can’t be undone, you won’t be crying cause you spent 50 bucks on it. This post contains some affiliate links. Click here to read my full disclosure. A no sew fabric adhesive. I used this one. 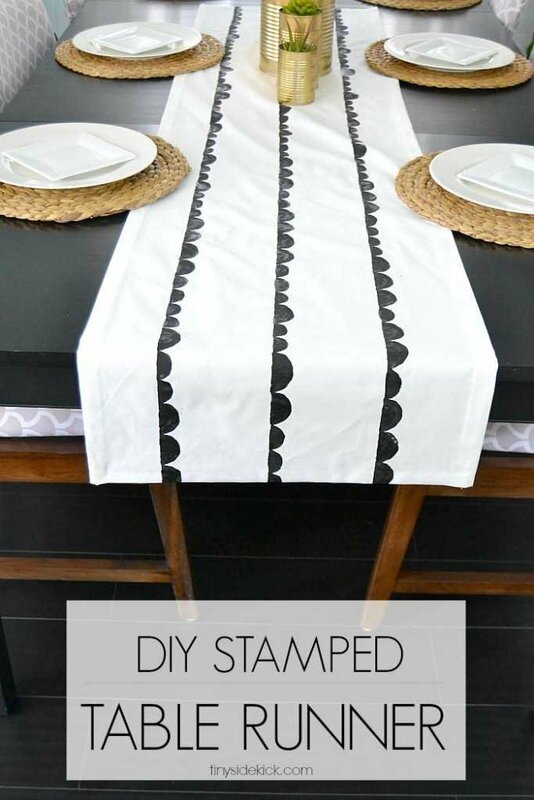 Step 1: Grab your fabric and cut it to the length and width that you want your table runner to be + 1.5 inches on each side for the seams. Step 2: From each of the the long edges, mark 1/2 and inch in, then 1 1/2 inches in. These will be your seam marks. 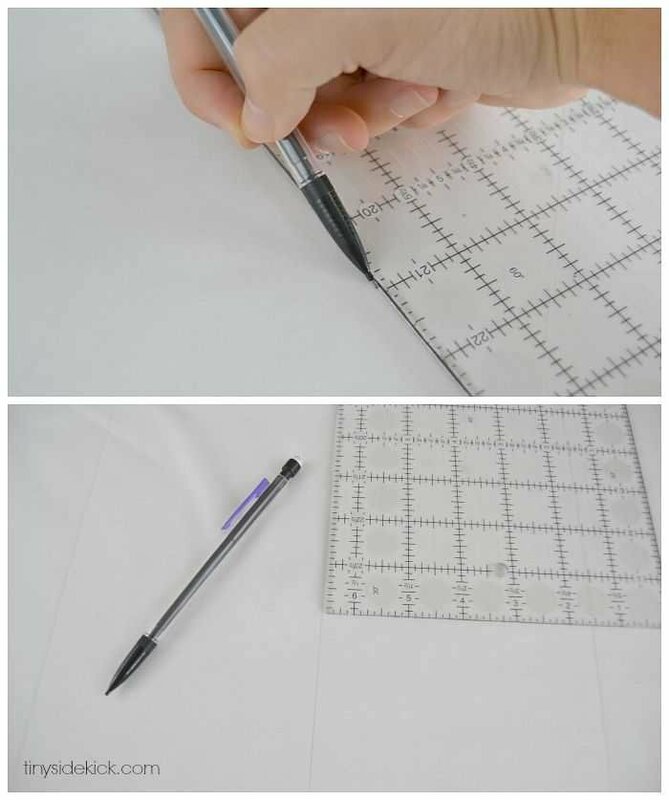 Step 4: Starting at your inside mark (the 1 1/2 inch mark that you just made,) measure where you want your lines of scallops to be (based on the math you did in step 3,) and draw a straight line from one edge to the other with a pencil. Mine were every 5 inches. 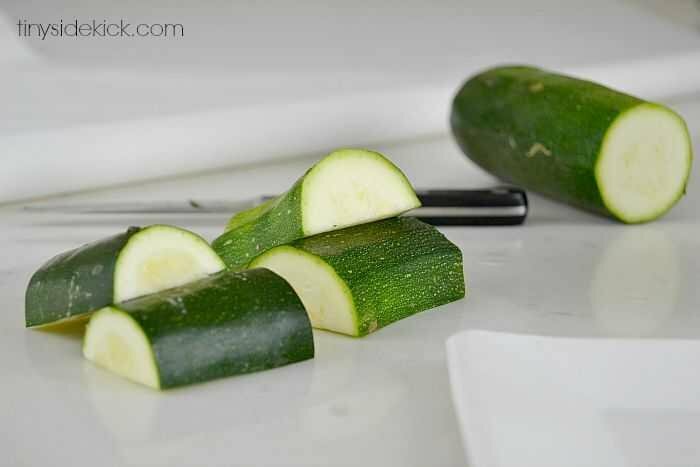 Step 5: Cut your zucchini in about 3 inch segments and then cut each segment in half. These are going to be your scallops, so if you want a smaller scallop cut your segments length wise about 1/3 the way in. You will end up with 2 uneven halves, but they will give you 2 different size scallops. I made about 3 different size scallops. Step 6: Pour your paint into a small bowl and have a paper plate handy to dab your paint before stamping your fabric. 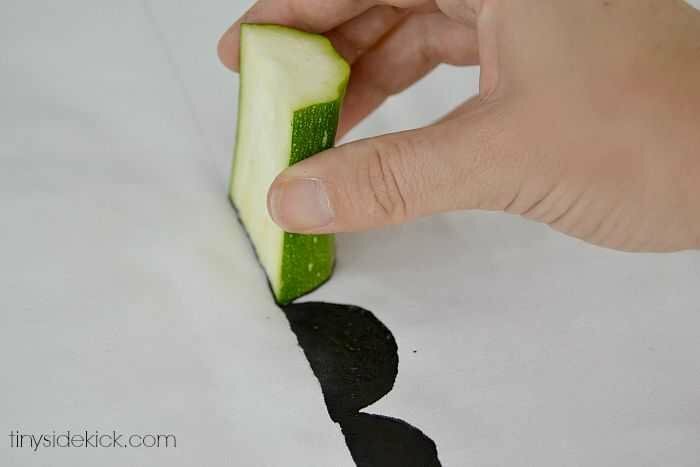 Dip the end of your zucchini into the paint (don’t go too deep) and dab it on the paper plate to ensure that you don’t have too much paint. Then stamp along the lines you created. I went in a total random order with the sizes of my scallops. Don’t be afraid to do a few in a row of the same size. 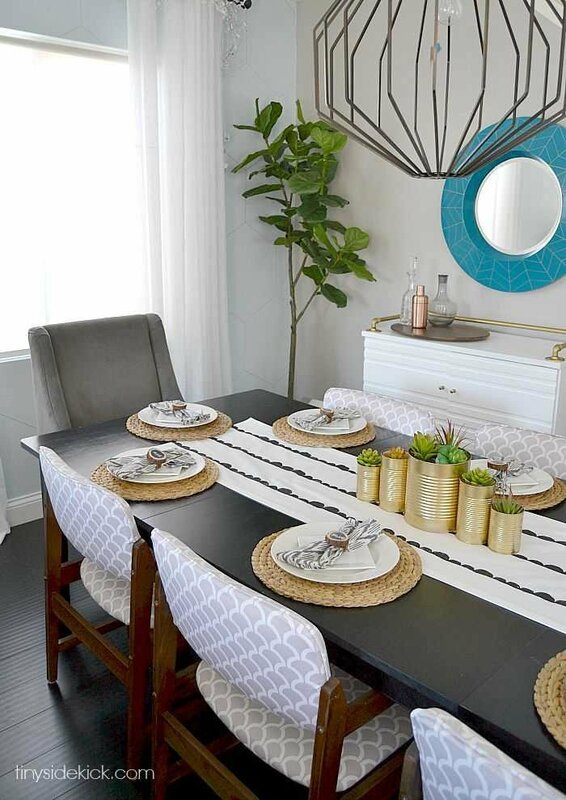 *Tip: Place a brown paper bag underneath your fabric so when the paint goes through it doesn’t create a total mess. 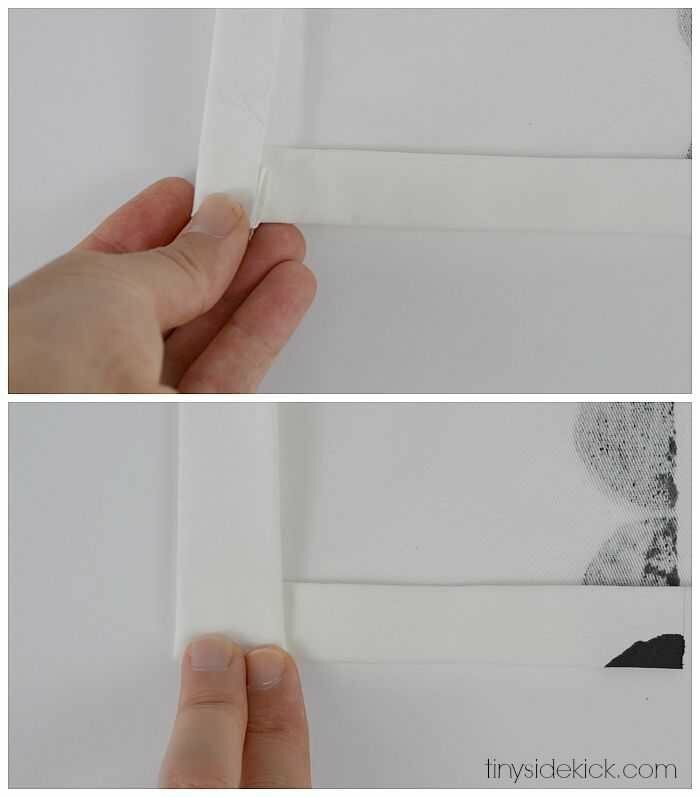 Fold each edge in 1/2 inch and then again 1 inch and iron flat to hold it in place. 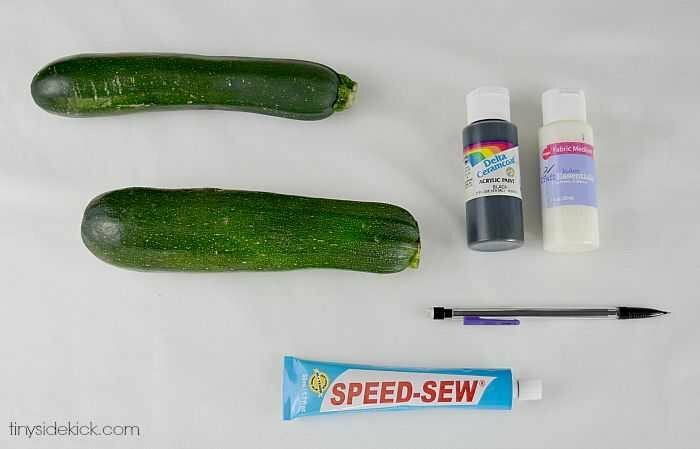 Step 8: Use a no-sew fabric adhesive to glue your seams down and let it dry. And that it is it! I went back and forth thinking that I should do this in a bright color or something, but in the end I’m so glad I stuck with black and white. 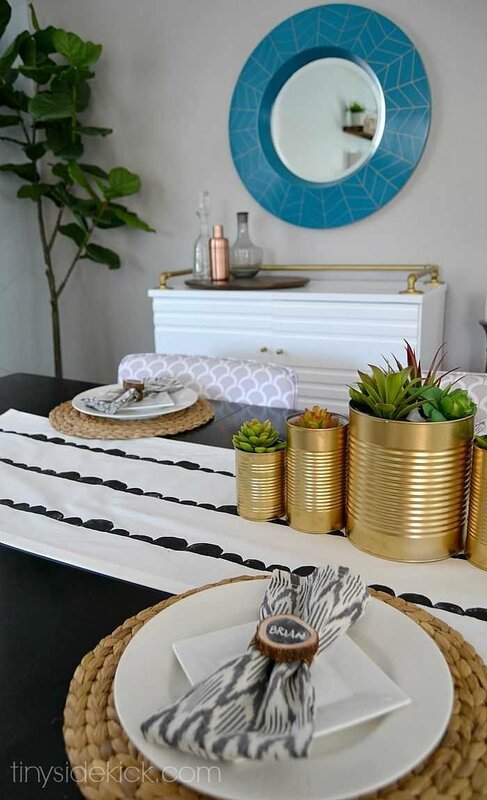 It will go with everything and really adds to the super simple modern vibe of my fall table this year. And come spring or summer, I will be able to use it in so many different ways like dressing up a buffet style gathering on my kitchen island! So smart! Really love this, Corey! Such a cute project! When I saw it on facebook, I wondered, and I got it right!! So funny! I just commented yesterday that I loved your runner and today you shared it here, ha! Looks great, pinning.